had issue with no tail lights, called left message, brian called at 9am yesterday, 12/31, came by at 1, found bad signal/light switch which had been warranty installed on 5th, replace with new, all good. 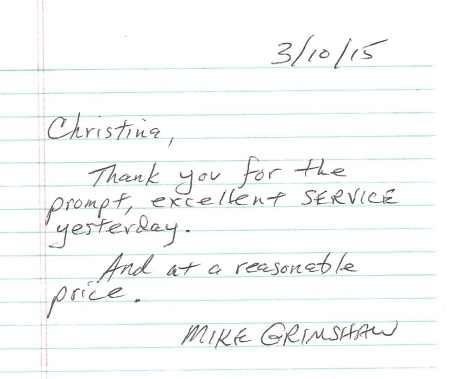 appreciate in quality and timely service. We just purchased our very first golf cart ever. Our salesman, Art, was very patient with us as we asked so many "beginner" questions. He really made the buying experience a good one. 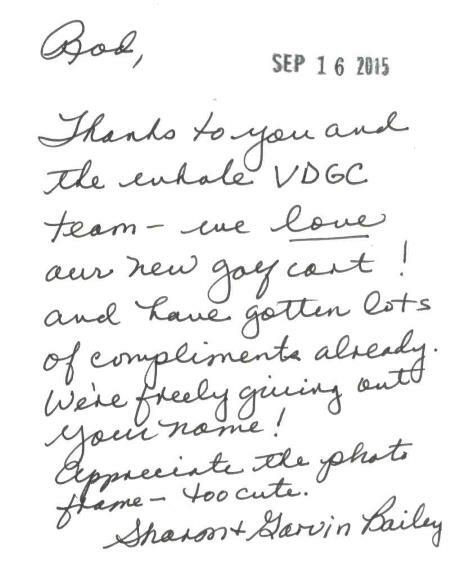 We would recommend VDGC to anyone looking for a pleasant and professional place to do business. 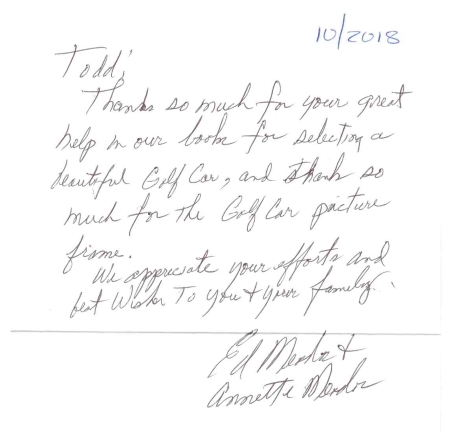 Our 2018 golf car was delivered yesterday from Village Discount Golf Car after after our visit with Art Roscoe, a knowledgeable and professional Sales representative We were most impressed with the entire experience especially after our prior dealings with "other" dealers . 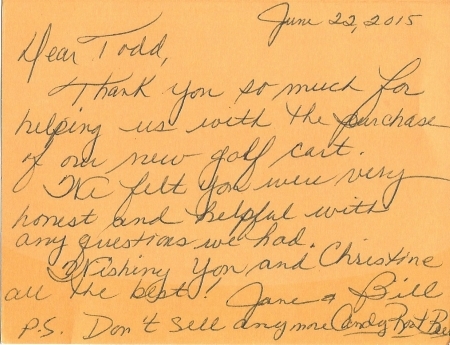 It is great to feel so satisfied with what we consider a terrific deal on a greatly improved Yamaha! I purchased my 2018 golf car with help from Art. He was a terrific salesman. He didn't pressure me and answered all of my questions. After I received the cart, he followed up with the sale and offered his assistance if I had any questions. A great place to do business! Thanks! We just bought a golf cart from Art. We had a great experience, and are very happy. Art was very easy to talk to, and we did not feel pressured. The few minor issues we had after delivery were cleared up immediately. Thank you Village Discount Golf Car. We rate you an A+. I posted yesterday as Bummed because I wasn't thrilled with my fabric selection when my new cart was delivered yesterday. Tom called me first thing the next morning and invited me back to the showroom to see what could be done to make me happy. Turns out that the colors that I wanted only come in two fabrics so I'm staying with what is on the cart. Tom made it very clear to me that he was willing to swap out the seat or give me a credit if I could find a better seat at a competitor's showroom. Bottom line is that their customer service is second to none. They bent over backwards in an effort to make me happy. Just had my car delivered today. Love everything except the seats. The purple inserts are very different from the ones that I liked on the used car that was in the showroom. Just want to thank you and your staff once again for a job well done. 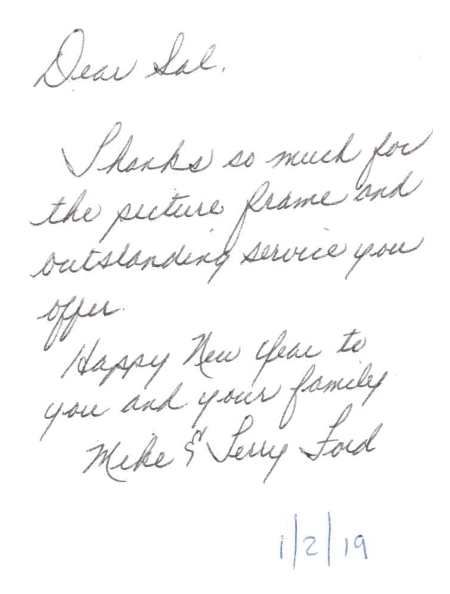 As a repeat customer you and your Sales Staff are all about customer appreciation and satisfaction. We worked closely with Todd (Sales) and yourself to once again purchase a 2018 Quiet tech. 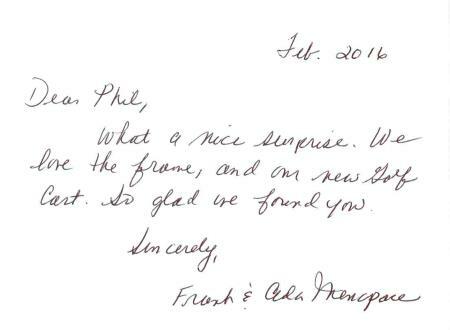 We kept our promise of a repeat customer and you kept your promise on what customers mean to you. Todd was very professional and handled our request in a very professional manner. We again will say "we'll be back" when it's time to purchase another golf cart. After much research and hours of due diligence, our decision to investigate "Village Discount" was a brilliant one. We met Todd the first day; he made us feel welcome and appreciated from the start. His friendly nature, honesty and uncompromising commitment to providing the ultimate in customer service was very evident from our first meeting. We informed him that we wanted exact features and color combinations for body, top, seats, wheels, dash and more. Todd made it happen, exactly as specified. We received our cart today. We couldn't be more pleased and grateful to Todd for his meticulous dedication for going above and beyond to make our cart dream a reality. 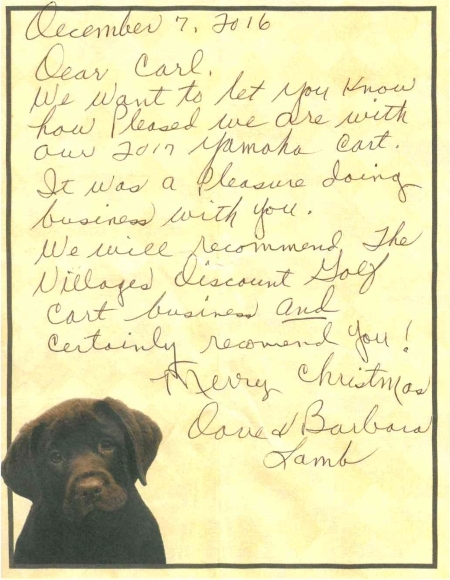 We will definitely be recommending Todd and Village Discount to friends, neighbors, family, all those with whom we come in contact. We feel we got the best deal from the best Sales Associate. Thanks so much, Todd. 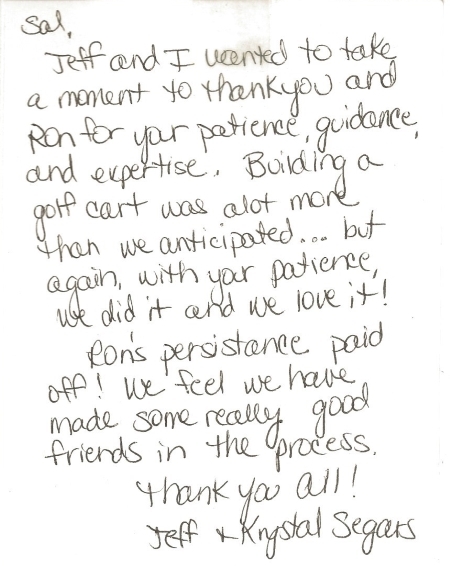 I wanted to thank you and your staff for the great experience that we had in purchasing our new golf cart. Carl did a great job with the sale and helping us with getting the exact cart that we wanted. We love it. 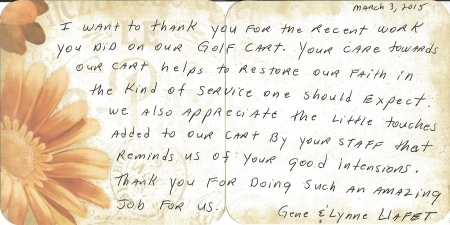 We will definitely recommend your company to anyone that we hear of that is looking for a new golf cart. P.S. Thank you for the gift that we received in the mail. It's a nice touch. Fantastic experince buying our first Villages golf cart. Worked with us to customise the cart to fit our Seahawk Colors! Its been a couple of months we are very happy with the service after the sale also! Todd and Lisa have been very helpfull. I just wanted to take a minute to thank you for your great customer service. This is our second opportunity to deal with Todd, first when my sister bought her car and today when we bought ours. Todd makes purchasing a golf car a most enjoyable experience, even though he is very good at separating me from my money! Just kidding. All of your personnel are very helpful and answered any and all of our questions. I will be happy and confident to recommend your business to anyone looking for a really nice golf car. Another great experience with the Village Discount Golf Car group! From office to maintenance they are the best people to do business with. 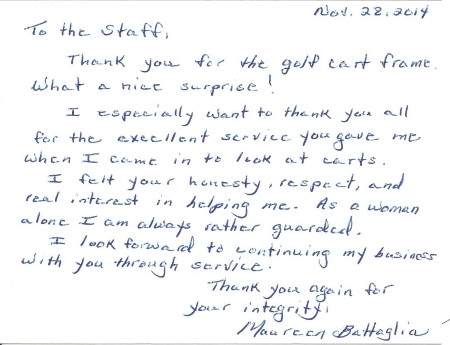 We just had our cart serviced for it's annual check up and as in the past, GREAT SERVICE! We stopped in to the office and asked for service and they set us up to have servicing done and the maintenance group picked up the cart at our house in the morning (on time) and returned it serviced in the afternoon. It is now working great! 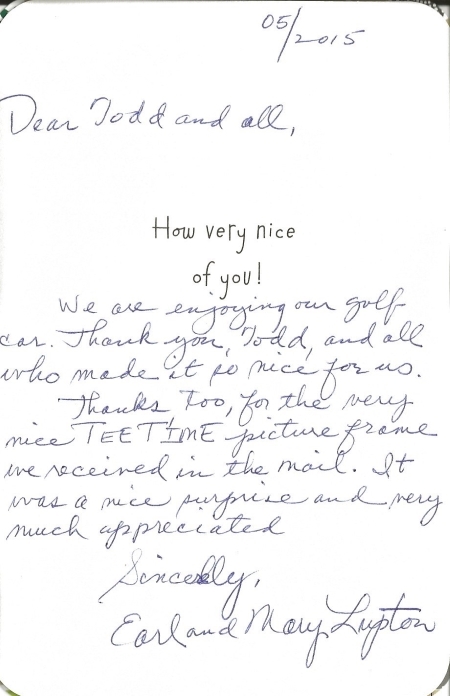 THANKS Village Discount Golf Car group! We just picked up our new 17 Yamaha Cart today. We purchased the cart from Country Village and the custom "Make Over" was done by Village Discount Golf. The cart is perfect from top to bottom. This is our third cart from VDG because we like to save money and deal with great people. The entire staff treats you like family. Your store is where we will always go to buy our carts. 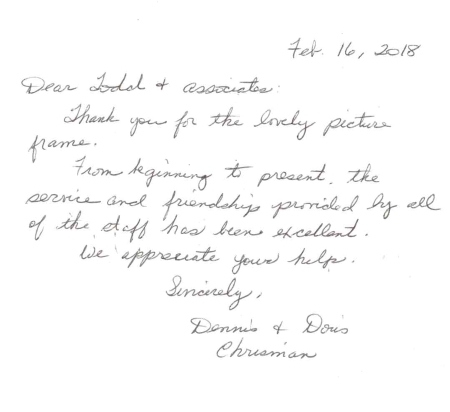 Special thanks from us on our recent service. 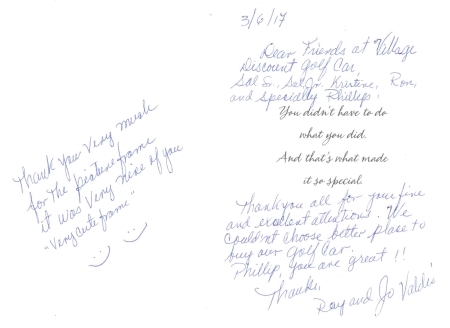 From the time we contacted your staff(Lisa)on August 14th@ 3pm to August 15th @ 2:15 our problem of a cracked heat shield on the muffler was repaired efficiently by your technician Phil. 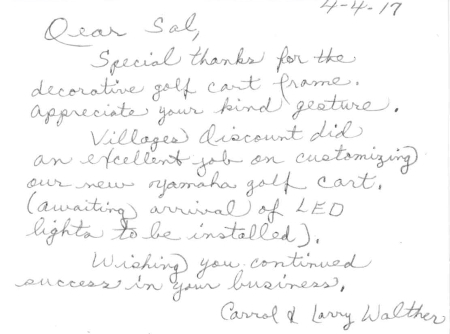 We've purchased 2 Yamaha golf carts from you and still have both. Talk about efficiency and satisfied customers. You have it way over the competition. You can be certain when we are ready we'll be back at Village Discount Golf Car to purchase once again. 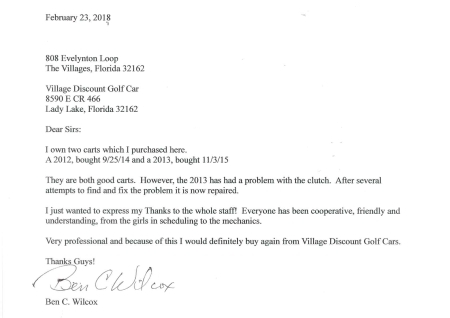 I wanted to drop you a quick note and let you know how happy I am with the support & service I've gotten from Village Discount Golf Car. 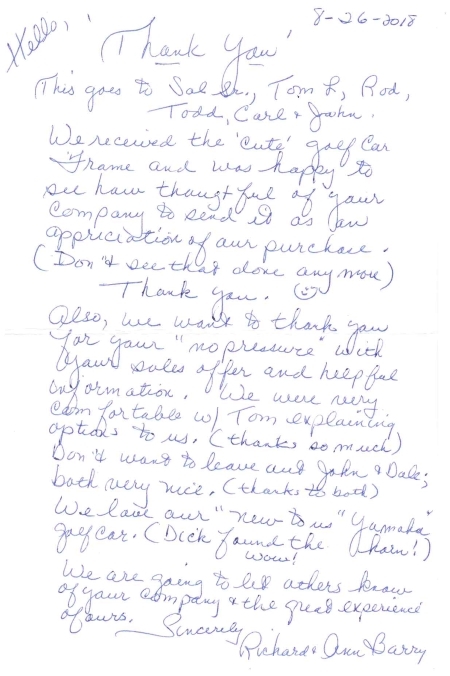 If you remember, I was looking at cars over at The Villages' Lake Sumter store and my neighbor Tom P. recommended you guys over them and it was the best decision I've made since moving to The Villages. Many times vendors tell you about how great their warranty and service is but often they never deliver. I appreciate you getting the ball rolling with Lloyd, on a Sunday no less, and he kept me well informed about when someone would stop by. You guys have been spot on fixing any problems in a timely fashion and Brian came by on schedule and did a great job of quickly fixing my cart and getting it ready to go. On top of that he was extremely pleasant and professional. Support staff is the key to success and yours has been great. Keep up the good work and feel free to use me as a referral and I'll be sure to recommend you to anybody I find that's looking for a cart. Being new to the Villages we shopped a number of cart dealers and shopped the classifieds and we found the Villages Discount Golf Car to be the best deal going. 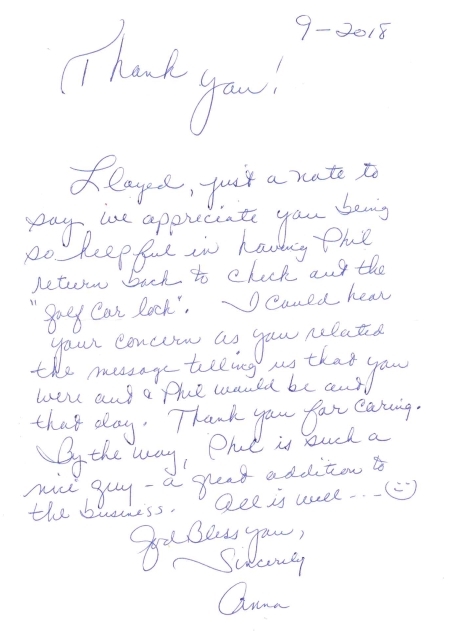 Carl was our salesperson and he is very honest, knowledgeable and friendly, he made the experience a lot of fun. Jim is the Sales Manager and he is not only super friendly he is very fair when negotiating. Overall if you are looking to purchase a beautifully reconditioned cart, you wont find a better deal than Sal and his staff have to offer. We just just bought a golf car from Discount Golf Car and it was a great experience. Everything went as promised and Jim O'Neil the manager delivered it when promised good service. Great price and great experience too! without seeing the color of the cart right there in front of me. This is when Tom the manager stepped in and suggested ordering the color with no obligation to me, and said that it would arrive in about a week. When the cart color came in, it was exactly what I was looking for and we proceeded to put all of the other pieces together. Along the way, I experienced a mistake in the order which I discussed with Tom, and he not only quickly owned that mistake, but he exceeded my expectations in every way. 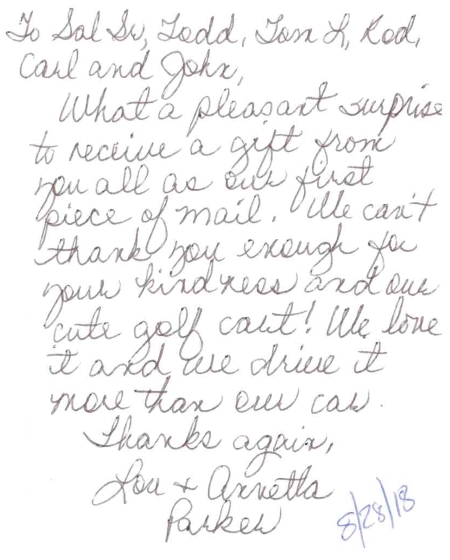 The delivery was great and everything was explained about the cart - truly a first-class company all the way. 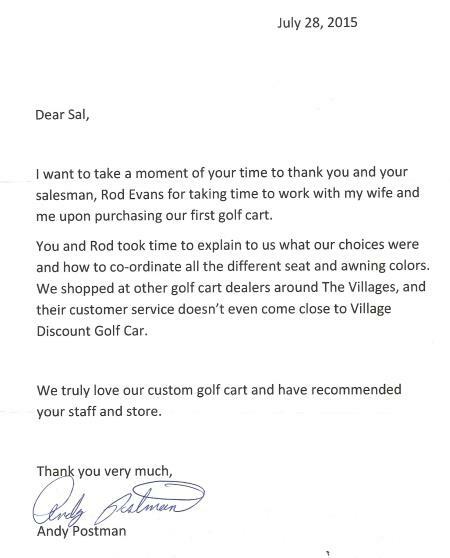 Everywhere I go I get compliments about the cart, and I tell them what great service I received at Village Discount Golf Cars. As a retired salesman I appreciated the no pressure presentation. They answered all of our questions and made spot on suggestions. The cart delivered on time, it is beautiful. I'VE OWNED MY CART FOR 5 MONTHS NOW AND BELIEVE ME I AM MORE THE PLEASED WITH THE CART AND THE PRICE. IF YOU DON'T BUY FROM VILLAGE DISCOUNT YOU'LL BE MISSING A GREAT DEAL. SHOP AROUND AND THEN COME BACK I PROMISE YOU IT WILL BE WORTH IT IN THE END. THE PRICE FOR A NEW ONE ARE STAGERING COMPARED TO A 2013 AND UP FROM THEM. WHAT A SAVINGS. THANKS AGAIN FOR A GREAT DEAL. BOB G.
After purchasing a 2014 custom cart earlier this year from VDGC we discovered, after a service call, that the cart was actually a 2012.5 according to the serial number. When I notified Tom of the situation he contacted Sal who called me the next day to apologize and offer a solution that was above and beyond fair. They went out of their way to make sure that we were satisfied. 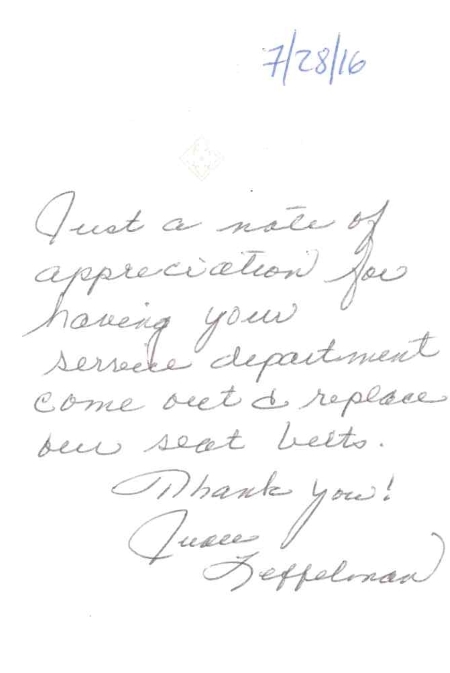 When they say that customer satisfaction is their number 1 goal, they mean it. Everybody makes mistakes but they stand behind their product. I highly recommend them if you are looking for a reconditioned golf car. 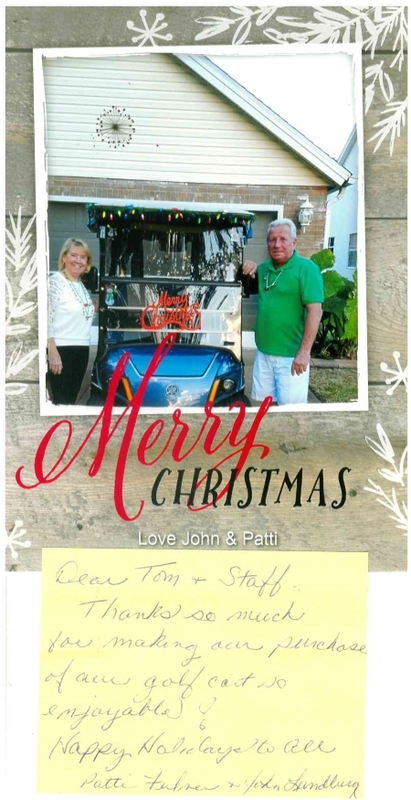 Thank you so much for your help with the purchase of our 2012 Yamaha Copper Golf Cart . 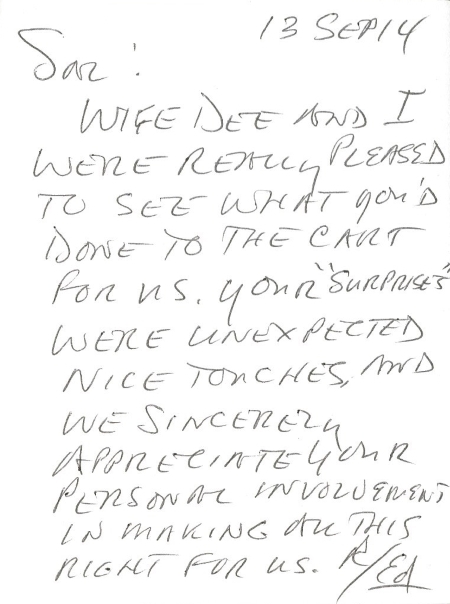 We loved dealing with everyone in your group and how they have handled the problem we experienced with the cart after it's delivery. The cart is working great now. We look forward to using all the services you provide. Also thank you for the Gift package that just arrived by mail yesterday. We will have our picture taken in the cart and put it in that frame. Thank you all so much for such a great experience. We are recommending you to our friends and aquaintances. 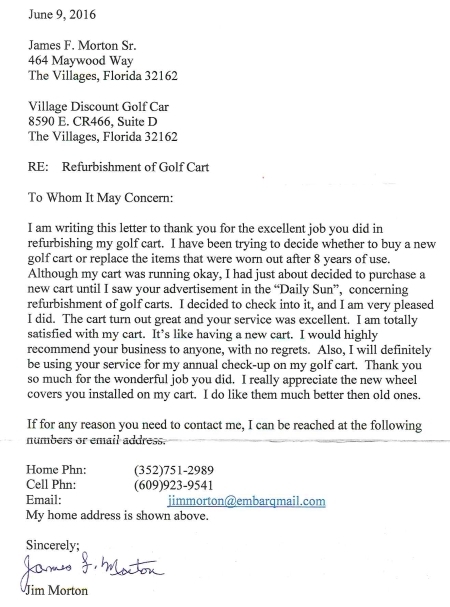 A special thank you to Sal and his crew at "Village Discount Golf Car" you went far beyond normal repair work. Our cart came back detailed with a steering wheel cover and roof support covers. We have been treated with total respect from everyone in your business. 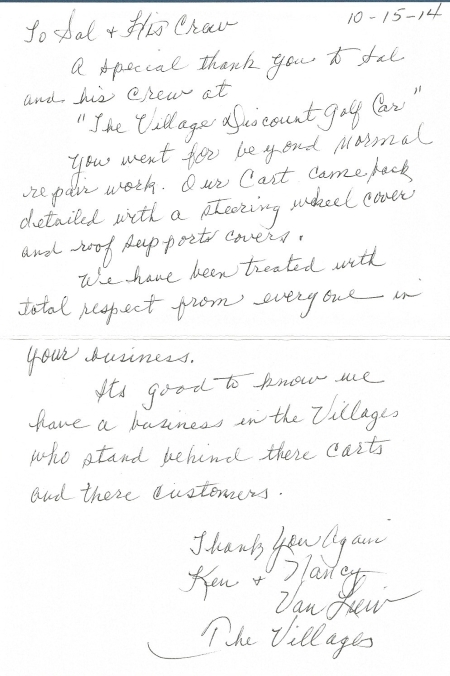 It's good to know we have a business in the Villages who stands behind their carts and their customers.